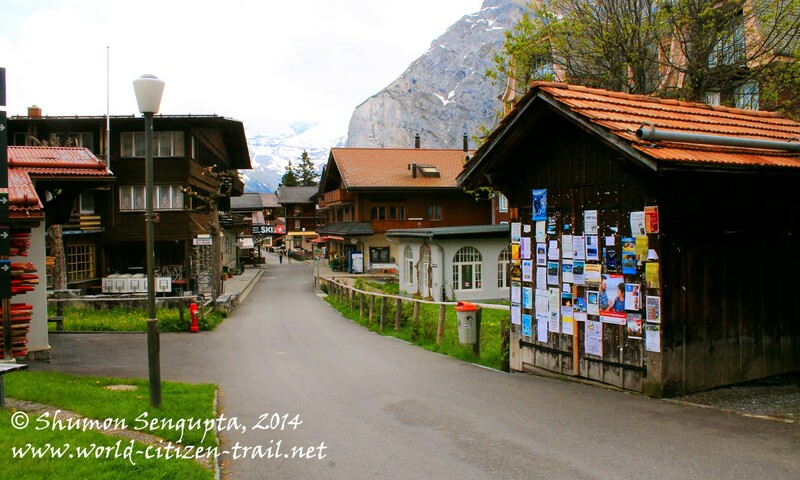 Mürren is a small, traffic free alpine village, tucked in a remote spot in the Bernese Oberland of Switzerland. 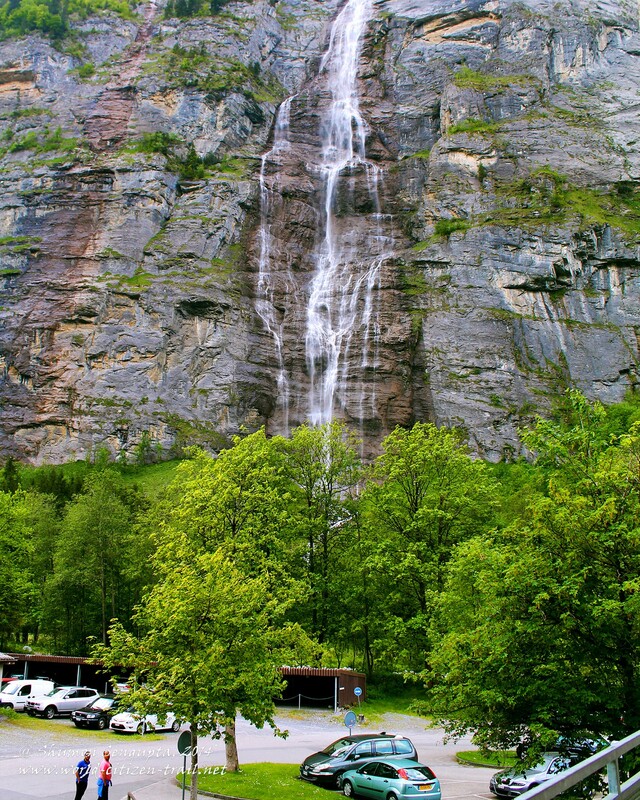 It is situated in the Alps, high up on a sun bathed terrace, at an altitude of 5,413 feet and 2,000 feet above the floor of the Lauterbrunnen glacial valley. 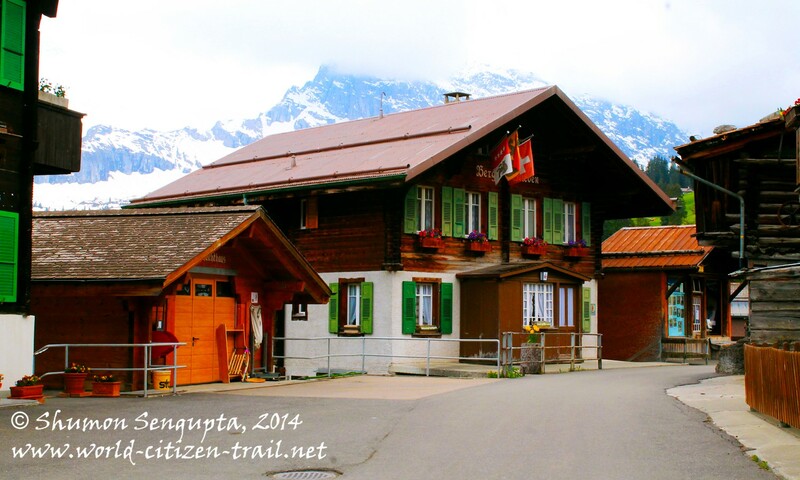 This village nestles at the foot of the imposing Schilthorn Mountain. 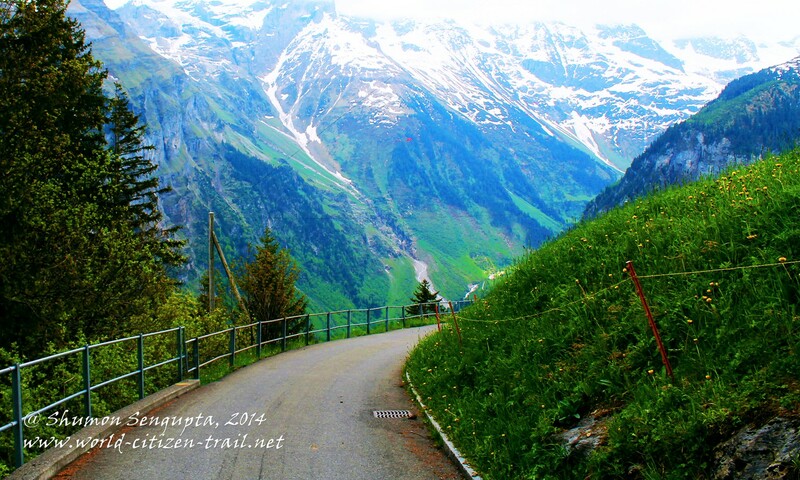 The way to Mürren is incredibly scenic. 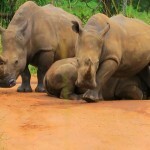 Being traffic free, you can’t reach there by road. 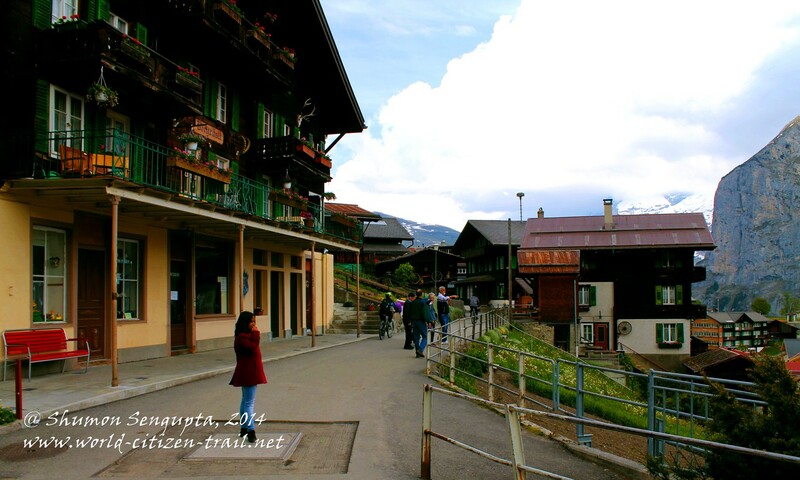 The way up there is by a series of cable cars or by a combination of cable car and mountain railway. 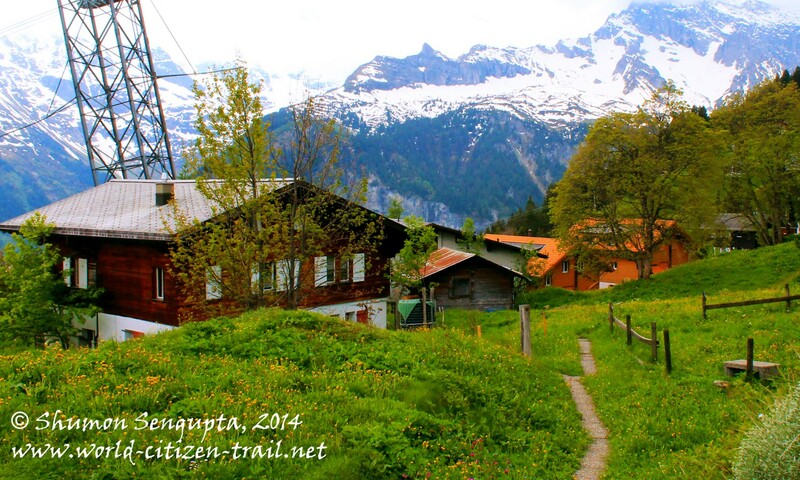 The village of Lauterbrunnen in the valley below can be reached by train from Bern, Zurich and Geneva Airports. 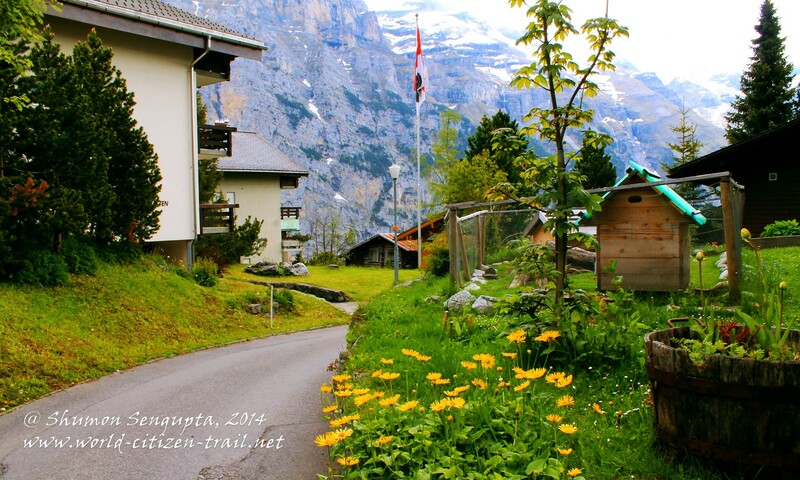 From Lauterbrunnen, the first leg is a spectacular journey up the mountain by a cable car which makes a steep ascends along 60degree gradient to Grütschalp, at 4,879 feet. 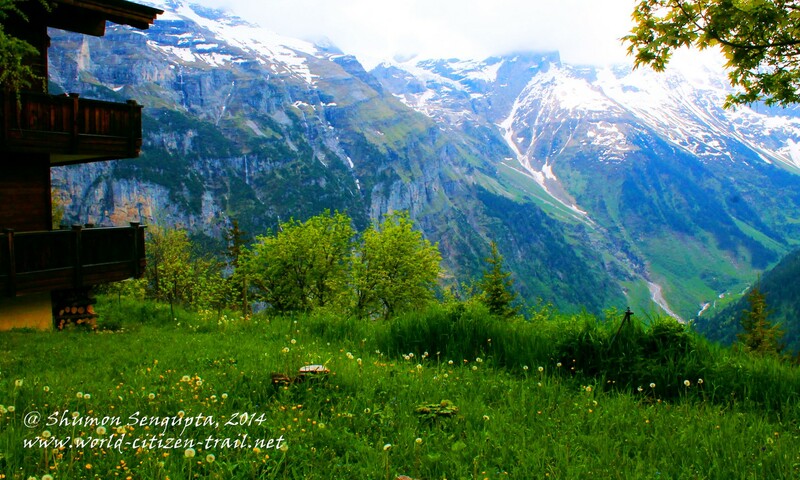 From there, the second leg takes you on the incredibly beautiful little mountain train that chugs its way along the ridge, through Winteregg, up to Mürren. 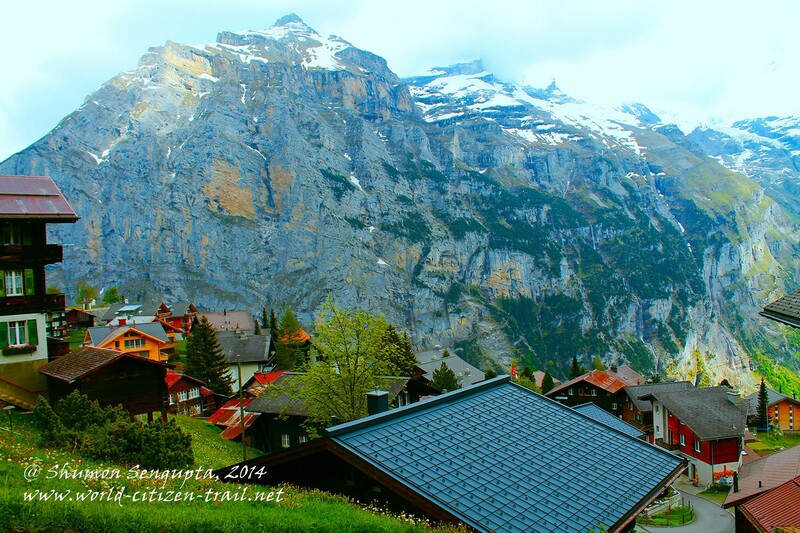 Since we were going up to Mürren from the Trummelback falls, we took the cable cars from Stechelberg on the valley floor, all the way up to Mürren. 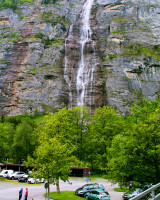 The cable car station in Stechelberg was located next to a tall waterfalls plunging against a vertical rugged rock face. 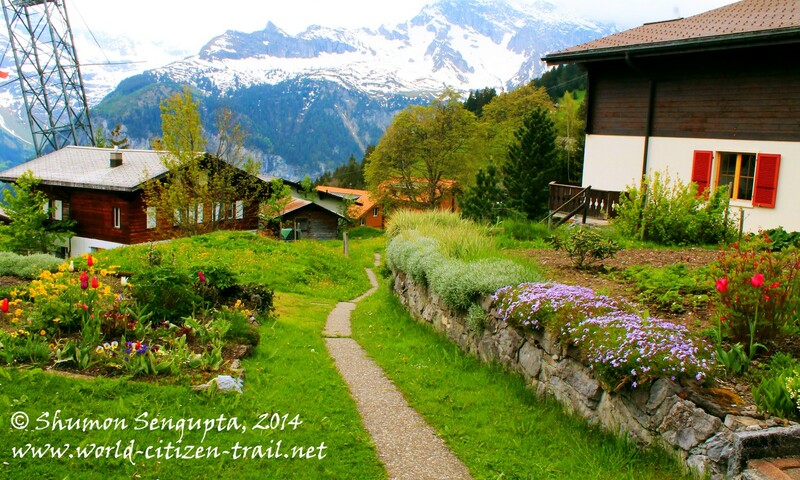 From there, we were swept over the valley’s western wall, up to the tiny village of Gimmelwald perched on the edge of a precipitous cliff. 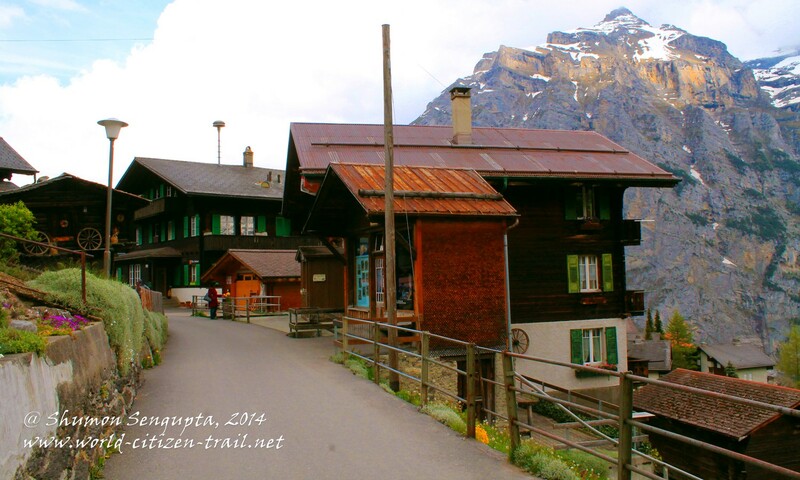 From Gimmelwald, our cable car took a further leap, on to Mürren. 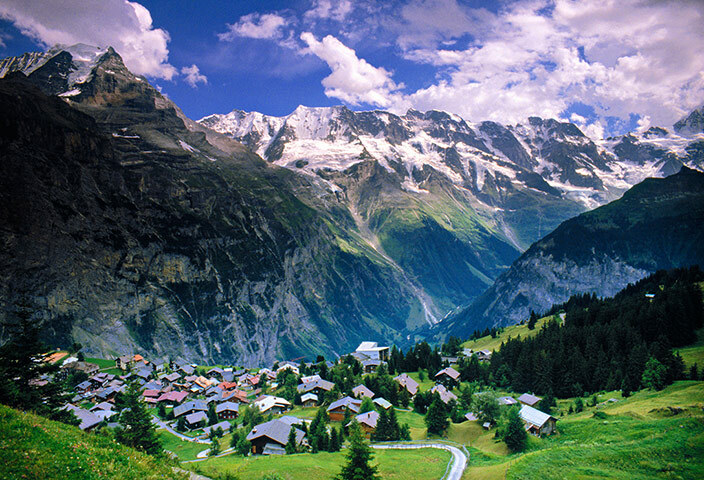 The location of Mürren is unique. 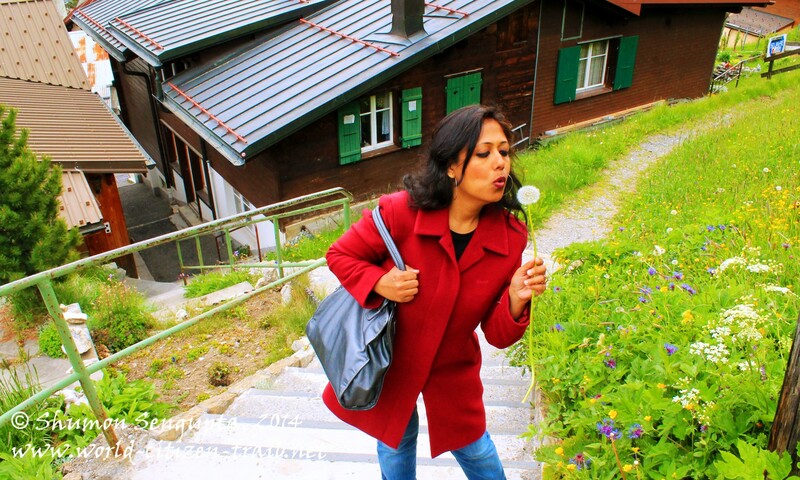 Situated at the base of the spectacular Schilthorn Mountain, down below, you have the sheer cliff plunging over 2,000 feet into the deep Lauterbrunnen valley floor and all around you see a dramatic mountain vista of imposing peaks. 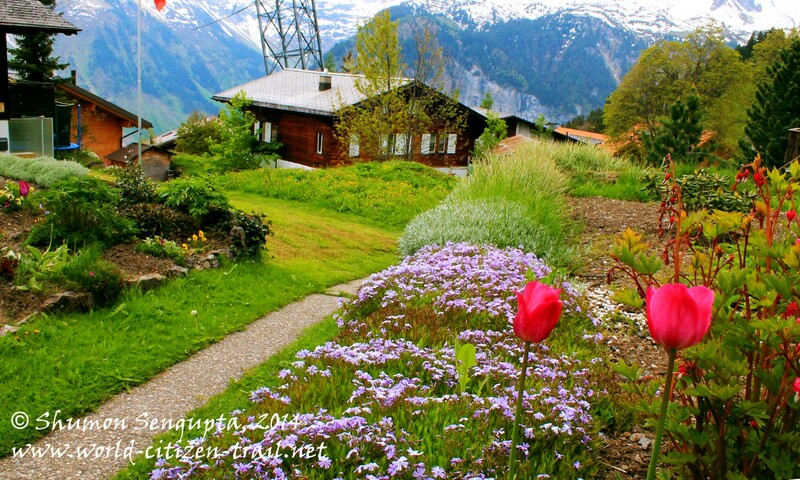 Across the valley, looms large the famous peaks of Eiger, Mönch and Jungfrau and you could spend the whole day, rather days, doing nothing but mountain gazing. 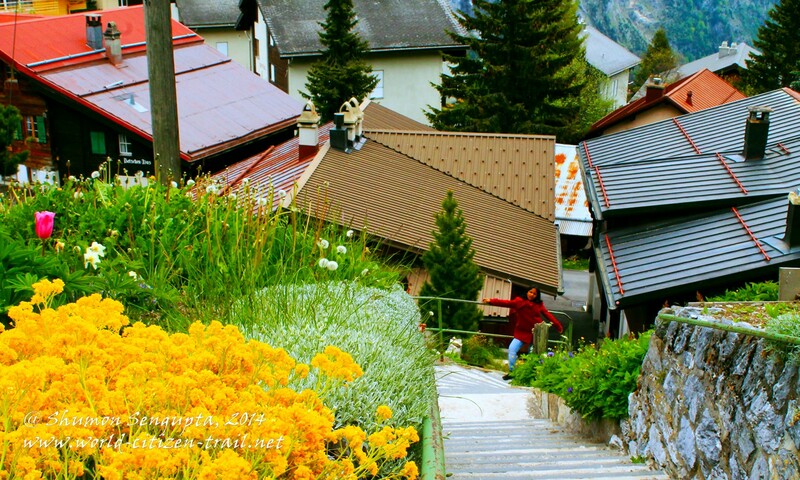 Cradled by soaring mountains all around, this small and charming village is placed along a high and narrow mountain terrace, with no other village or hamlet beyond, lending it an end-of-the-world feel. 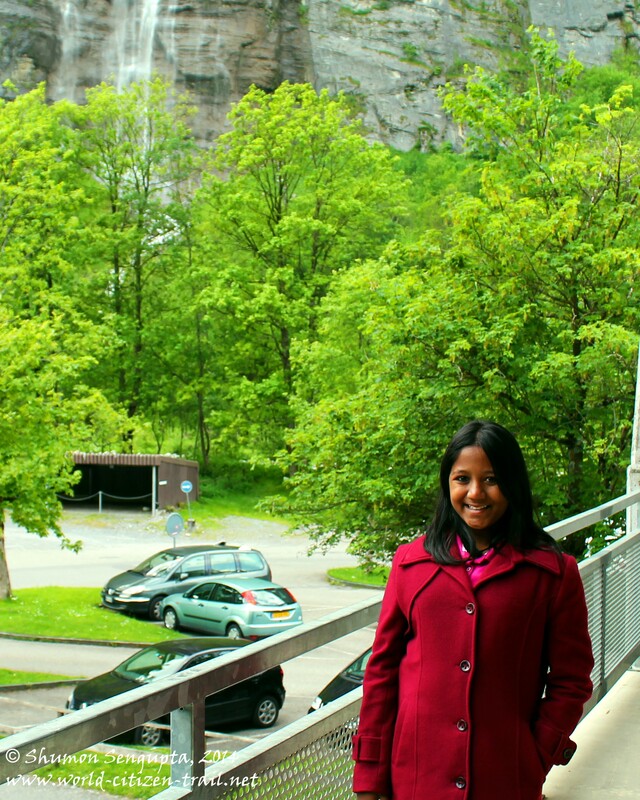 This incredible terrain has some of the most precipitous and plunging mountain sides and cliffs in entire Switzerland. 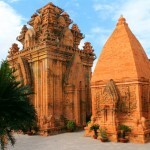 Hence it is a popular destination for base jumping and paragliding, in addition to climbing and mountain hiking. 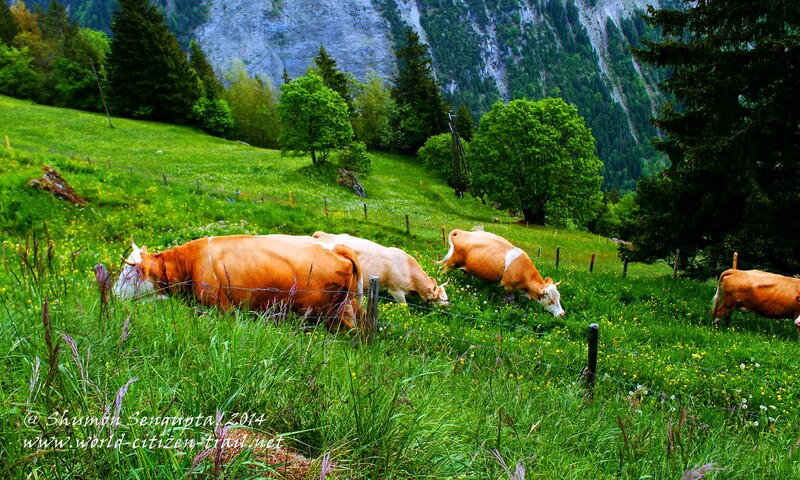 In fact, it is considered one of the best hiking destinations in the Alps and is characterized by steep slopes, valleys, meadows with bell-ringing cows, alpine wild flowers, numerous streams and waterfalls and deeply secluded nature trails. 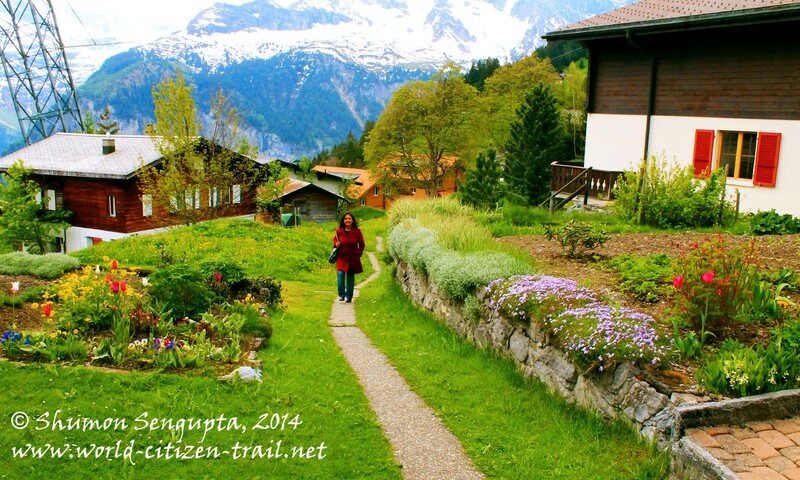 There are various trails that loop the village – miles of beautiful, well maintained and marked trails starting from the center of village. 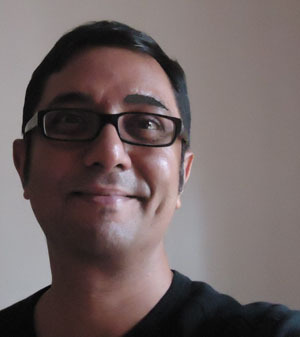 Estimate walking times are given in hours and minutes. Trails that are marked by a solid yellow sign are easy to cover and can be done by anyone. But if you see a red stripe on the trail marking, you should know that the route is challenging and is meant only for experienced hikers. 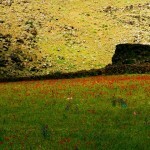 Two red bands indicate a high level of difficulty, meant only for the highly experienced dyed-in-the-wool hikers and climbers. 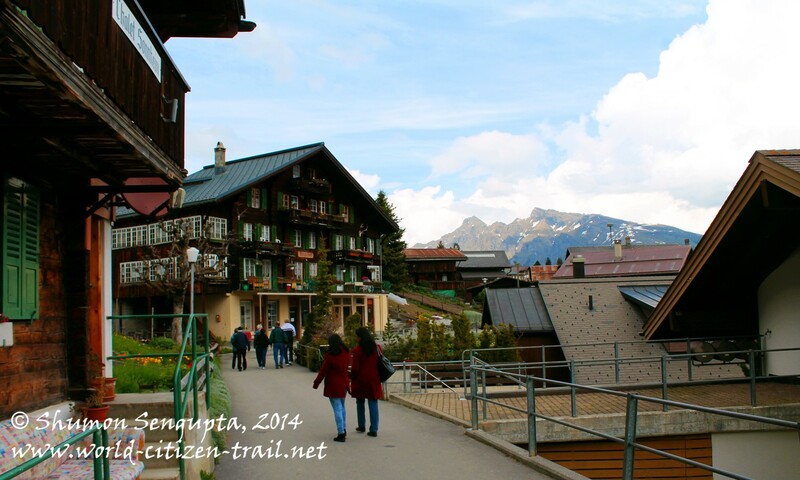 We walked along the narrow streets, past wooden chalets decorated with curious installations. 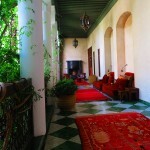 The houses also had little gardens, flower boxes hanging from balconies and stone walls from whose crevices flowers bloomed in profusion. 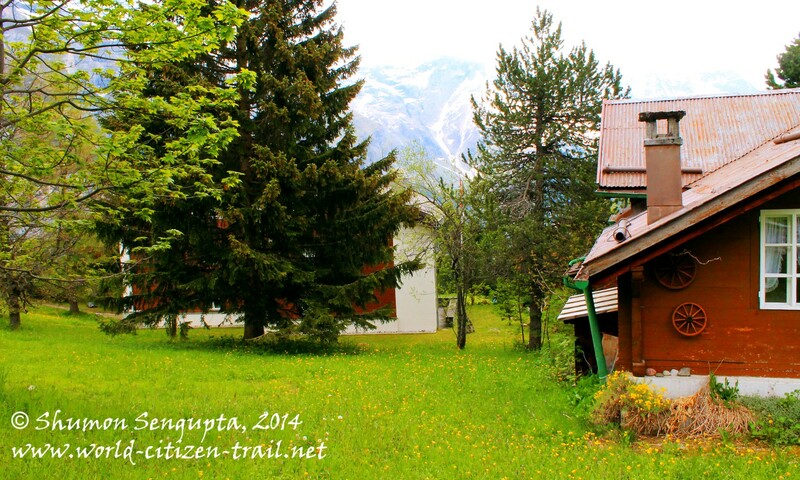 The chalets were small, built in the traditional modest Swiss style – mostly one to three storied high, built at different levels, in total harmony with the surroundings. 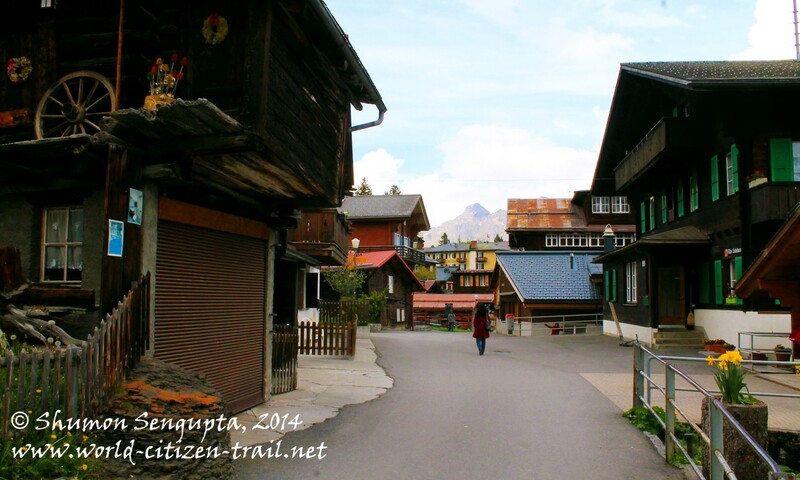 The houses are built over a sharp incline – hence at places, we got the feeling that we were walking through the roof tops of the chalets. 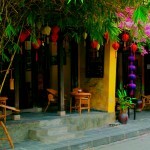 Apart from the two churches, the most noticeable buildings were flower decked hotels with bars and restaurants. 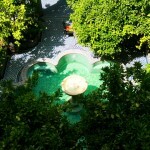 It also had charming drinking water fountains, gushing with sparkling, fresh mountain spring water. 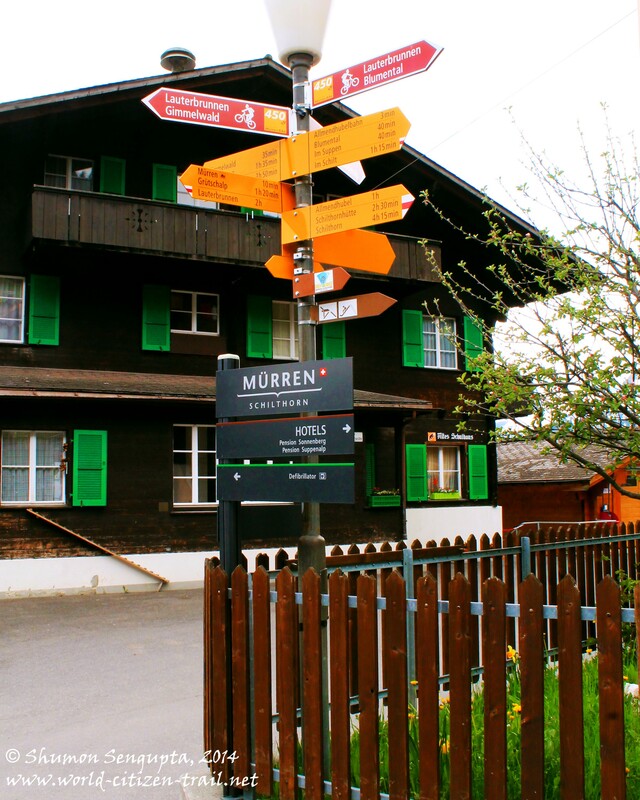 Although Mürren had a long history (it is after all the highest, continually inhabited village settlement in the canton of Bern) the buildings were fairly later day constructions. 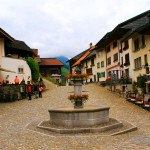 Hence it did not have the old-world rustic charm that we found in the villages of Soglio, Guarda, Ardez in Graubunden or even the village of Gimmelwald, further down from Mürren. 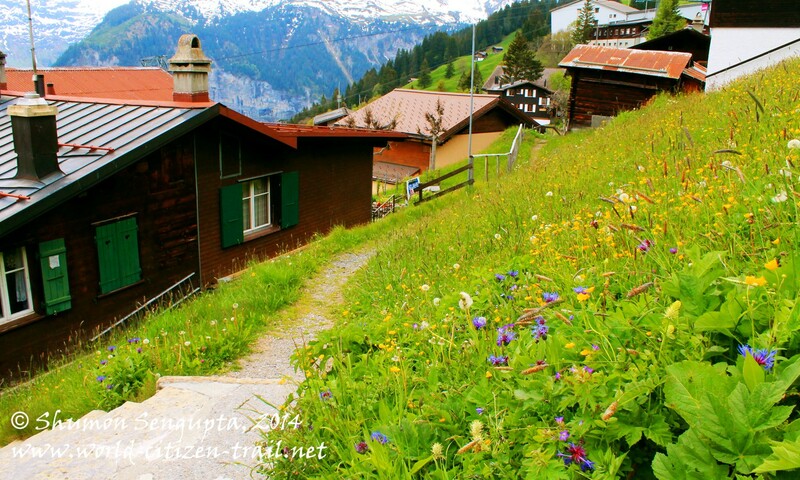 But then one doesn’t go to Mürren to admire the village; one does to gaze at the mountainscape or ski or hike or walk or do paragliding or base-jumping. 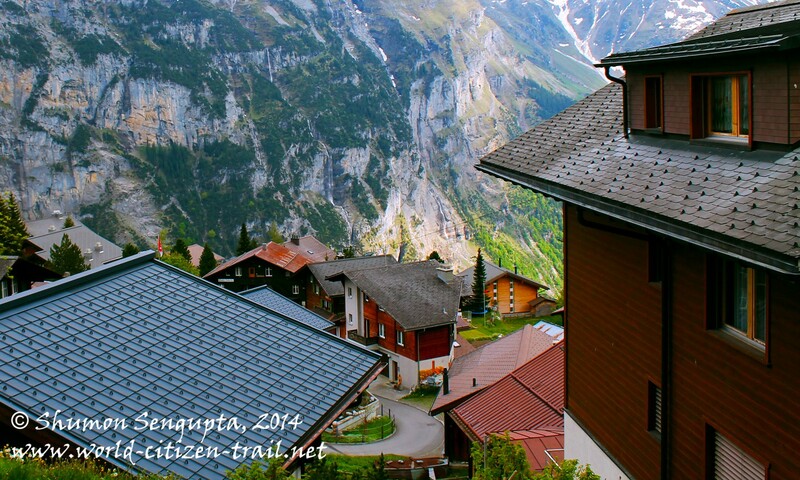 And as alluded to earlier, getting to Mürren is itself half the charm and appeal of the place. 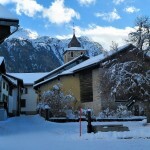 In winter, this village is a popular ski resort. Being the highest ski resort in this region, often it has the best snows for purpose. 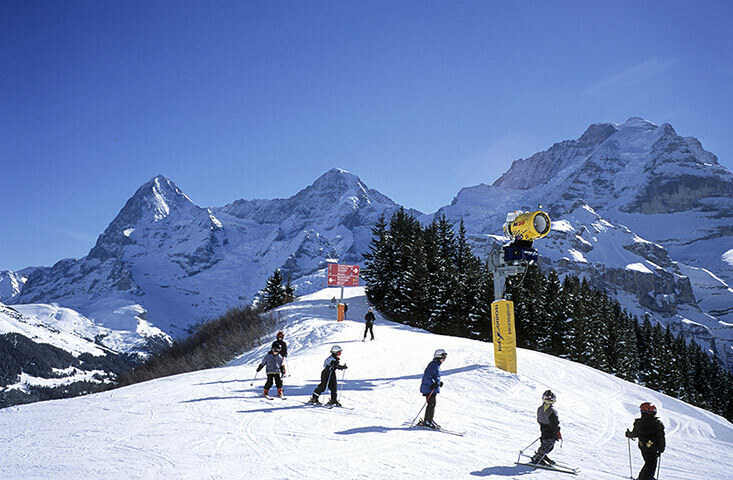 The extensive skiing area around Mürren has 33 miles of prepared slopes and 12 ski lifts. The village also has a very impressive and popular sports center, which includes a ice skating rink. 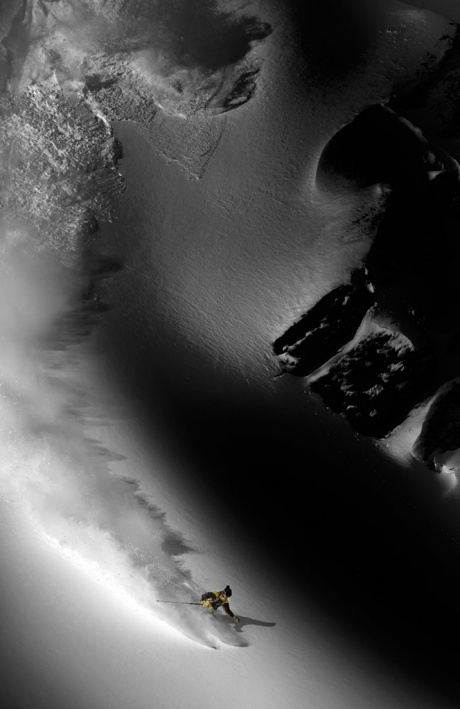 It has long been a favorite for British skiers. 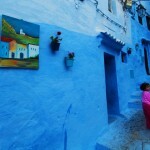 The village is said to have less than 500 residents, but beds for 2,000 visitors for the peak ski season. 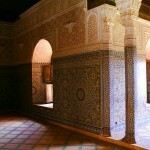 It is also a great place to visit during the spring/summer; hence it sustains on tourism almost throughout the year. 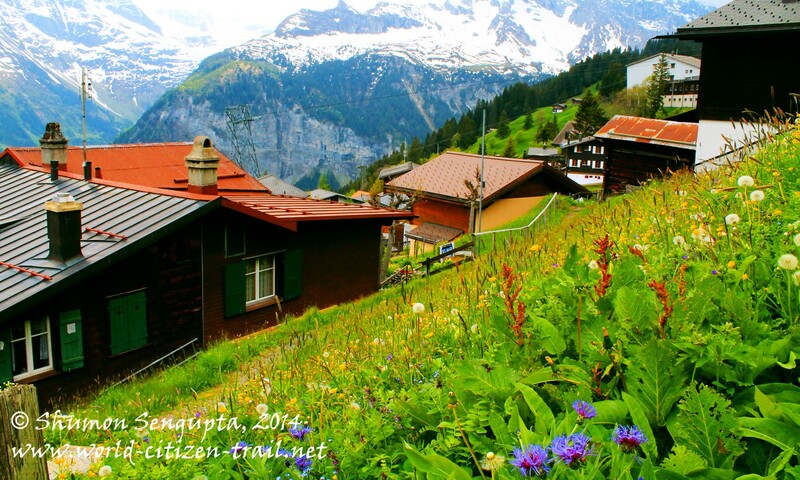 From Mürren, a cable car goes further up in two stages to the Schilthorn summit, at around 10,000 feet above sea level. 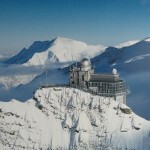 At the Schilthorn summit, there is the revolving Piz Gloria restaurant, made famous in the Bond Film On Her Majesty’s Secret Service. 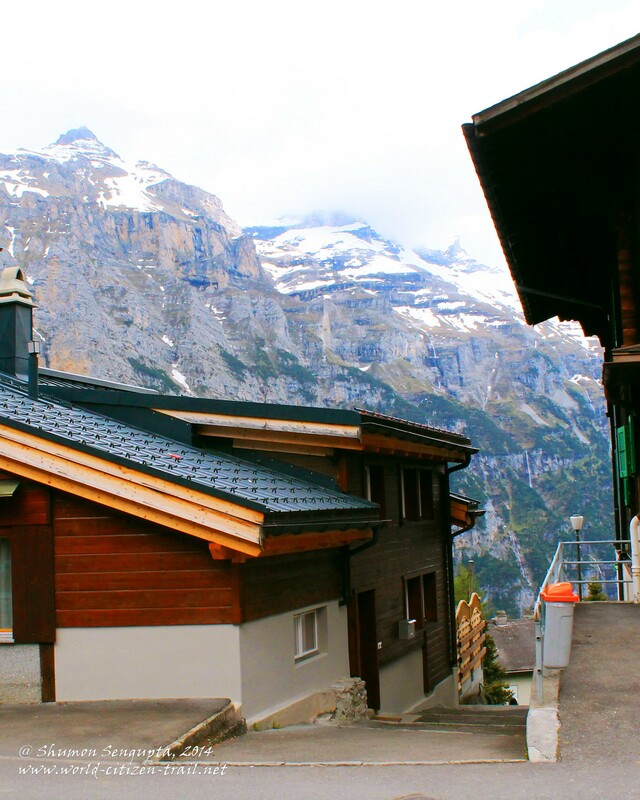 It is said that on a clear day, sitting in the revolving restaurant, on a 360degree turn, you can see over 200 mountain peaks (including the Eiger, Mönch and Jungfrau) and 40 glaciers! 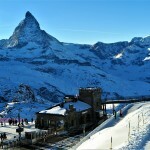 It was here that the villains chased Bond down the steep slopes, in an adrenalin-fueled, nail-biting ski chase. 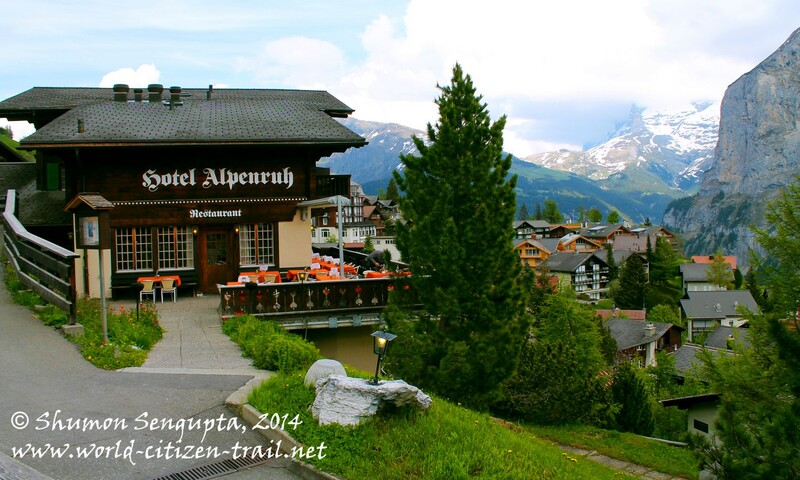 The Schilthorn is also famous as the starting point for the annual Inferno Race. The aptly named Inferno is considered the world’s longest downhill ski race; an event in which 1,800 skiers race against time over a 10-mile long, 7,100-feet plunge over snow clad steep mountain slopes, down to the village of Lauterbrunnen. 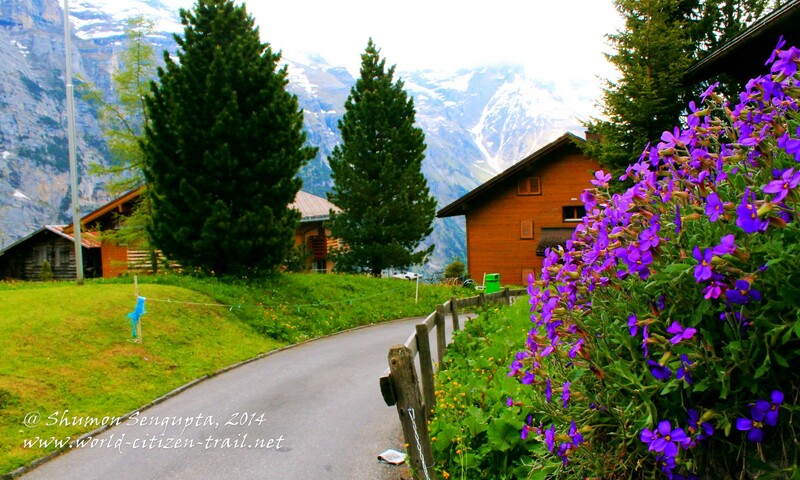 From Mürren, we had two choices – the take the cable car up to the spectacular Schilthorn or take the incredibly picturesque hike down to the village of Gimmelwald, perched precipitously at the edge of a cliff. We did the latter. 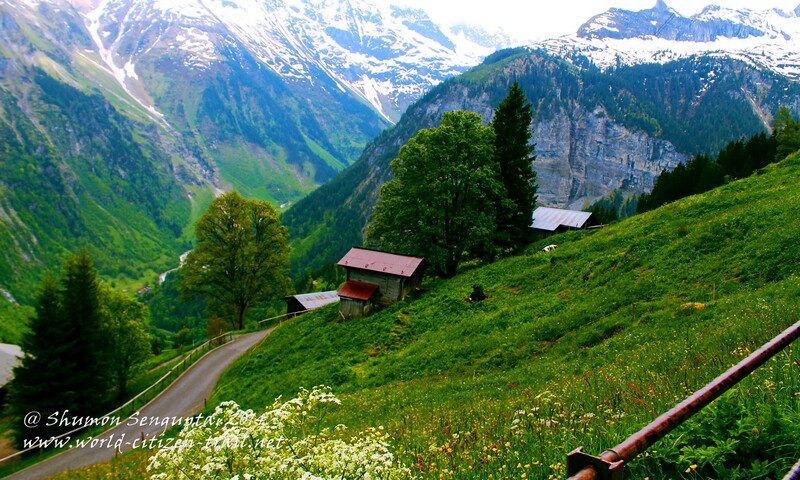 This route (a paved narrow road) winds its way down a series of rocky terraces along the mountain side, past grazing cows in lush meadow, streams and panoramic view of the mountains across the Weisse Lütschine valley, framed by soaring snow-capped mountains.